2 cups greens to serve - swiss chard or kale - sliced and kale stalks removed. Make the seaweed butter: Soak dulse in a bowl of cold water for 10 seconds, until wilted. Squeeze with your hands and roughly chop. Place in a food processor with butter, lemon zest and juice, sea salt and pepper. Blitz until smooth, stopping once to scraping down sides of bowl. On a sheet of plastic wrap, shape mixture into a small log about 1 1/2 inches in diameter. Roll up, seal the ends and chill until firm. Butter can refrigerated for 1 week or frozen for up to 1 month. Steam vegetables at this point by placing vegetables in a steamer over simmering water. Heat fry pan over medium-high heat. Add a swirl of olive oil, and when it’s hot, add 1 tablespoon of tseaweed butter to the center of the pan. When bubbling and hot, and beginning to brown, add fish. Fry until golden brown on one side, then carefully turn over. Cook on the other, adding a little more butter if you’d like, until the fish is no longer translucent. It doesn’t take long. Transfer to a serving plate. Spoon greens into fry pan, turning in the butter. Spoon greens onto fish. 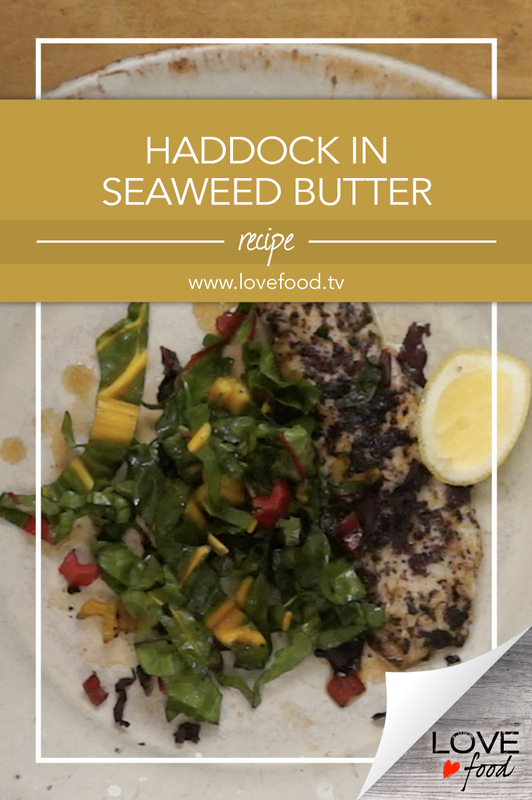 Squeeze with lemon and top with a little sprinkling of dulse.